Two Chicks On Books: Blog Tour- THE HAWKWEED LEGACY by Irena Brignull An Interview! 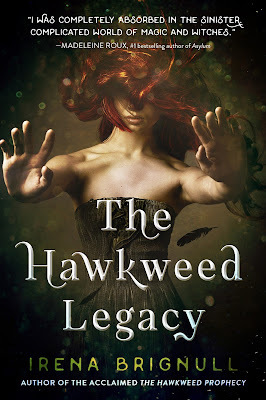 Blog Tour- THE HAWKWEED LEGACY by Irena Brignull An Interview! Hey everyone! I am thrilled to be hosting a spot on the blog tour for THE HAWKWEED LEGACY by Irena Brignull! I have an interview with Irena to share with you today! Haven't heard of THE HAWKWEED LEGACY ? Check it out! o For the readers: can you tell us a little bit about the events leading up to THE HAWKWEED LEGACY and the characters? In THE HAWKWEED PROPHECY, we first meet Poppy and Ember when they are swapped as babies. Poppy is brought up in a regular home on a regular street, but has weird powers she can’t explain. Ember lives deep in the forest in a secret coven of women with magical powers, though she has none herself. The two girls meet as teenagers and, not realising how their fates are entwined, they forge a friendship born out of isolation and a lifetime of not fitting in. This sets them on a course fraught with danger as they discover their true origins, learn about the spell that swapped them, and try to figure out where and with whom they belong. For they both have fallen for a homeless boy, Leo, and their feelings for him put their friendship to the test. · Is this the final book in the series? Or is there more to come? For the moment, this is the final book in the series. I’ve started writing something new and have a lot of ideas for other, different books. But never say never. I can imagine wanting to revisit the Hawkweeds again. · Were any of the characters in the book inspired by people from your real life? No one specific but I drew on some of my own feelings as a teenager, and that of my siblings and my friends. Also, the books are about mothers as well as daughters, and how damaging a mother’s ambition can be. I took this idea to an extreme but, with three children of my own, I had plenty of examples of different styles of mothering to draw upon. · Who was your favorite character to write? What about your least favorite? I loved writing Poppy because she’s so prickly and confused and full of potential. I also loved writing Charlock because she has so many hidden depths. My least favorite? That’s a hard one because I value all of them, even the wicked ones. I think it would have to be the more minor characters, perhaps the witches in the Eastern clan, who I didn’t have time to get to know and fully. · What is your favorite passage/scene in THE HAWKWEED LEGACY? There’s a scene in a zoo near the end of the book which I hope is very dark and dramatic. I physically felt the tension as I was writing it and I loved the idea of these trapped animals trying to call out to help the character who’s in peril. · What kind of research did you have to do for the story? I mostly rely on my imagination for the witches and their spells, though I did research a lot about the natural world - the flight patterns of migrating birds, plants and herbs with healing properties, when certain plants blossom. Also, the story starts in Africa where I’ve travelled a bit but I needed to do a little more research on it. · Who is your ultimate book boyfriend? What a great question. I wish I had time to give it a real think but my mind immediately went to Heathcliff (a terrible choice as really not good boyfriend material) and Atticus Finch (a far better idea). · What inspired you to write YA? I actually hadn’t even heard of the Young Adult category when I wrote my book so I had no preconceptions. I wasn’t trying to write in a certain genre – I just had an idea for a story and a deep interest in my teenage characters. Those years between childhood and adulthood are such a vivid, confusing, emotional time, full of first experiences. Very rich territory for a writer. · What are you reading right now? Or what do you have on your TBR that you’re dying to read? I’m reading Power by Naomi Alderman. It takes the idea that women have developed the power to release electricity through their bodies, and looks at what this does to society. It makes me think of my coven of witches in the forest and why they choose to stay separate from the rest of the world. Next on my TBR list is The Hate U Give by Angie Thomas which I’ve heard such good things about. · What Hogwarts House would the Sorting Hat place you in? One of my readers told me I’d be in Ravenclaw so I’ll go with that. Twitter. I’ve never done facebook. I like to swim against the tide in my own tiny way. Insects. Pathetic of me, I know! · Song you can’t get enough of right now? · 2017 Movie you’re most looking forward to? Baby Driver. Can’t wait to see it next week. 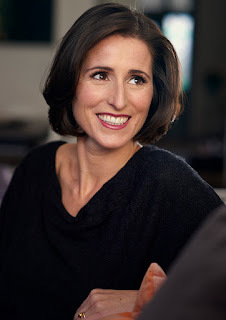 I’m Irena Brignull, a screenwriter, novelist and mum. I live with my family in London but I was brought up outside the city in the beautiful Chiltern Hills. The other place that has my heart is Greece where many of my relatives are from. My first novel, The Hawkweed Prophecy, was published in June 2016. The sequel, The Hawkweed Legacy, was published in June 2017. I write screenplays too. My screenwriting credits include the Oscar nominated movie, The Boxtrolls, starring Ben Kingsley, Elle Fanning and Simon Pegg. (I was nominated for Best Screenplay for that one at the Annie Awards in 2014.) My adaptation of The Little Prince, directed by Mark Osborne and starring Jeff Bridges, Rachel McAdams, James Franco and Marion Cotillard, closed the 2015 Cannes Film Festival. I also adapted Skellig for Sky which starred Tim Roth, John Simm and Kelly MacDonald. Before all this, I was a Script Executive at the BBC and then Head of Development at Dogstar Films where I was the script editor on Shakespeare in Love, Captain Corelli’s Mandolin, I Capture the Castle and Bravo Two Zero to name a few. And before that, I studied English Literature at Oxford University. I don’t have much spare time but, in it, I like to read books and watch movies. It’s kind of my job, I know. But one day I plan to take up lots more hobbies - horse-riding, tap-dancing, baking, juggling…?